So who’s been too busy working so much so that they have been having take-away’s or entering a fast food chain domain for a quick and easy dirty fix these days? Who’s also been hooked onto the latest Naked Chef’s 15 minute meal TV show? Well when you put two and two together like that, it’s pretty much a no brainer as what the outcome would be. As I am writing this, I have had a very long and busy day. My food intake for the day has been a total of 1 Up & Go packet drink and 1 cup of tea. Okay, maybe 2 glasses of water as well. Famished, I rushed home, put some clothes to the washing (it’sstillsunnyoutside,summeriscoming,hoorayyay! *say it really fast in one breath*) and put some water to boil to cook 2 half boiled eggs. In between, I snacked on some murukku (indian fried dhal snack). OMG! It’s really not that hard to stop (take a breath and listen!) and take stock of what you are doing. Pause. Open up the fridge and pantry and invent something. 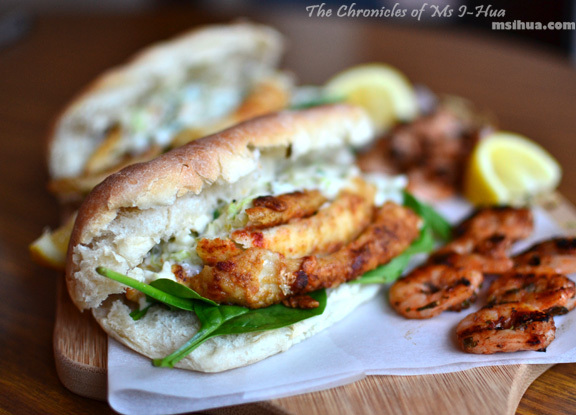 Luckily for us the other night (when I was better prepared after being inspired by Jamie) we got some fish fillets and hit up some of his Bangin’ Fish Bap recipe. Obviously, we didn’t follow everything (or anything) on his original recipe, but heck, it took us 20 minutes to whip this delicious meal up, so I’m not complaining! 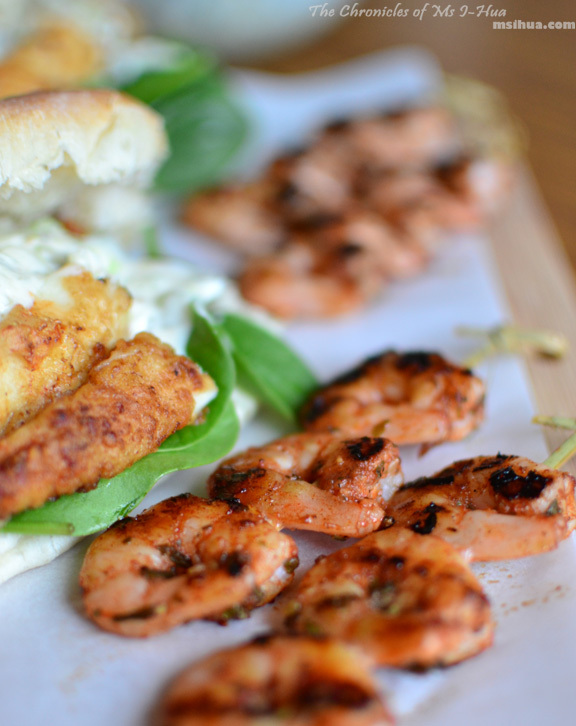 Marinate prawns with all of the ingredients and set aside as you prepare the tartare sauce and fish burgers. 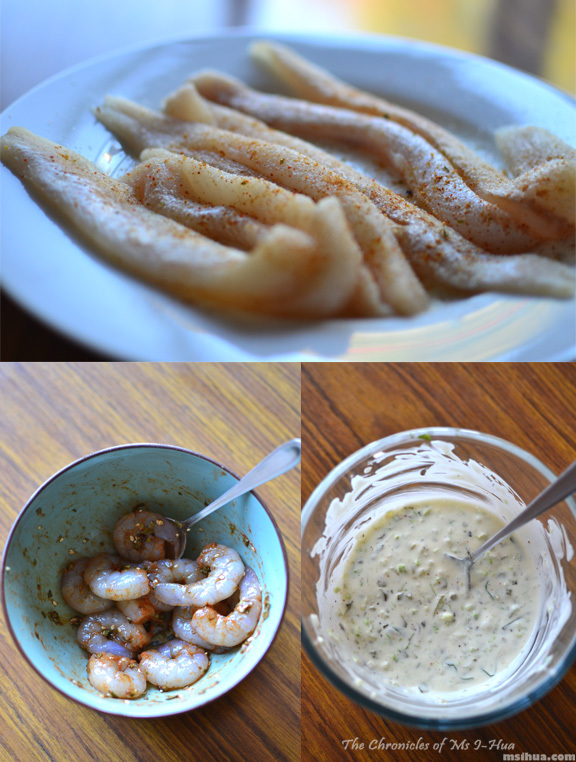 Season fish fillets with an even layer of paprika, cayenne, onion powder and salt. Set aside to marinate. Prepare the tartare sauce by placing all of the ingredients required in a food processor and blend it for a minute or two (depending on whether you prefer it chunkier or smoother). Dust the fish fillets with some flour and place them on a hot frying pan for around 3 minutes (this depends on the thickness of your fillets) on each side. As you are cooking the fish, pop the Turkish buns in the oven at 100 degrees Celsius (C) to heat it up. Heat the grill and place the prawn skewers on it. They don’t take long to cook so be careful not to overcook them. They should be pinkish and firm to touch when cooked. Take the buns out of the oven and slice open the middle. Place some baby spinach leaves, followed by the fish fillet and tartare sauce. 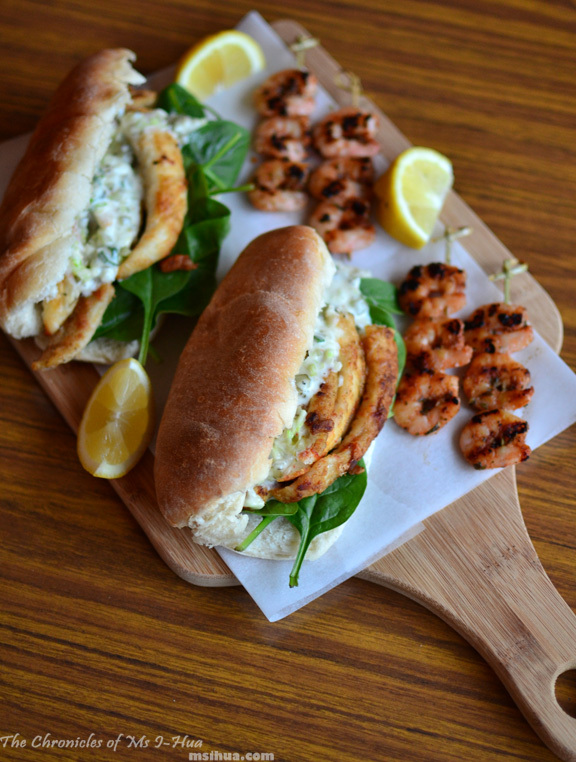 Serve the fish burger and prawn skewers with some freshly cut lemon wedges. So whaddaya think? Did we do a good job of replicating Jamie’s meal? It could have been healthier if we bought the recommended yoghurt for the sauce, but we made do with what we had in our fridge. We had a few of the delicious turkish buns leftover for another 2 meals, so I cooked up some wicked spam (luncheon meat) and eggs for breakfast (don’t judge me) and the Boy made Grilled Chicken Rolls the next night. Have you been watching Jamie Oliver’s 15 Minute Meals and have you been inspired to cook one of his recipes? It’s hard when one is busy 🙁 Can’t wait for my honeymoon! Haven’t even planned for that yet! He is just so addictive to watch isn’t he? im inspired but question whether how much time i would need to put the kettle on, heat up the oven, put the pans on the stoves and take all the ingredients out from the cabinet and fridge..not to mention the time i need to clean up the mess if i have to season everything from a height..all that said, i can’t wait find the right recipe to try! We did it with chicken too the next day! So there is hope? AND I LOVE that you join on my superexcitedspeechbubblesentences! Or spam! If you are so inclined that way 😛 I had it with spam and egg but you could so do it with bacon and egg and turn it into breakfast! Oh the burger looks so good! So fresh and healthy but packed with flavour. Love. It! The dip was the best part! Oh no you’ve been so busy 🙁 One Up and Go and a cup of tea isn’t enough! You need to make sure you eat more and mor regularly too!